Phuket is the main tourism destination in Thailand, of which over 9 million tourists per year. The main attractive places are mostly Islands and coral reefs. The tourists buy a package tour from snorkelling and diving tour operators. The massive tourism can make a huge impact to coral reefs. Therefore, the tour guide play an important role to protect the coral reefs by being a role model in good briefing on reef conservation to their customers. Green Fins gave a presentation on coral reef ecosystem and sustainable use to the volunteers. 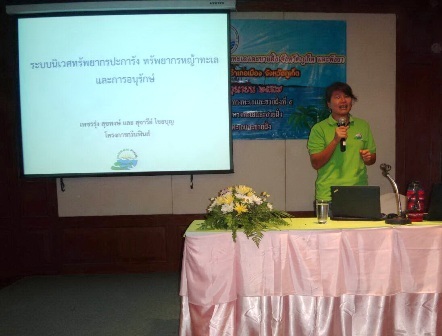 There were 18 participants as representatives from 7 snorkelling tour operators in Phuket attending the workshop. 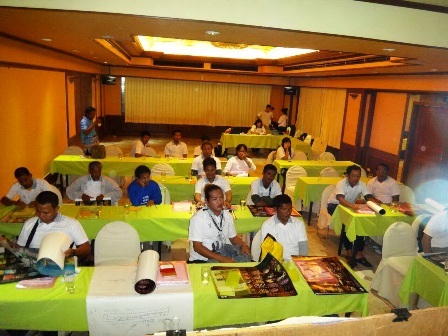 They were a member of Healthly Reef Club which Khun Chacris Klingklib (Eddy) is the leader of the club. At the end of the workshop, the participants made a brainstorm on how to solve problems that they saw at sea, and developed an integrated snorkelling tourism action plan. 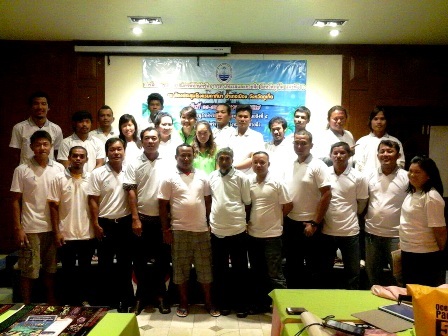 The participants were interested in Green Fins Ambassador program, to assist Green Fins project in action. For monsoon season of Andaman Sea in July-September, Green Fins will organise a training of trainer about best practice of the best snorkelling tour guide in Phuket, Phang-Nga and Krabi. Please follow upcoming acticties at Green Fins Events.